Extech Instruments’ TK430-IR industrial troubleshooting kit is a portable system to address electrical testing needs for installation and repair of electrical systems, HVAC equipment and large appliances. The kit comes with an EX430 True RMS autoranging digital multimeter, an MA200 400A AC clamp meter, a 42510 mini infrared (IR) thermometer, a 40130 non-contact voltage detector, a set of CAT III-1000V test leads, a Type K thermocouple bead probe, a Type K banana input adaptor, a multimeter hanging strap, and batteries. The multimeter offers 11 functions, including AC/DC voltage and current, resistance, capacitance, frequency, temperature, duty cycle, diode and continuity. The IR thermometer provides non-contact temperature measurements on surfaces that are difficult or unsafe to reach with readings between minus 58F to 1000F. The clamp meter delivers 6 functions: AC current, AC/DC voltage, resistance, diode and continuity. 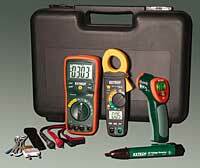 The 40130 non-contact AC voltage detector measures voltages from 100V to 600V.